Although they were ridiculously difficult to photograph thanks to their muddy orange-brown color, these muffins tasted so good, I had to post the recipe anyway. They were the product of my recent quest to develop a morning muffin that is healthy, lower in calories and carbohydrates, a little bit sweet, and delicious all at the same time (because I was craving a good muffin but didn't want to give up my diet entirely). Healthfood-y muffins always make me have to wonder what in the world is in them to get them to taste worth eating in the first place; and usually if we're talking about a low-fat muffin made without oil, it's tons of sugar. I sort of think the morning muffins I came up with are the perfect balance of sugar, oil, and high-fiber superfood grains — the perfect balance of tasty and healthy. I chose to add slivered almonds and pecans to my muffins, but walnuts or a mixture of all three types of nuts would taste just as wonderful. And even if you're not a big fan of raisins, I recommend keeping them in this recipe — they provide added sweetness and really enhance the flavors of the other ingredients. 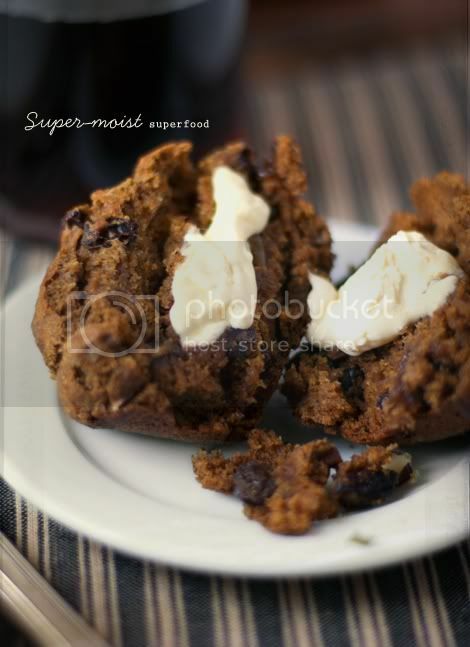 Why are they "superfood" muffins? Mainly because flax meal is what many consider to be a superfood — it is rich in Omega-3 fatty acids, high in fiber, and high in antioxidants. Pure Veggies use flax meal frequently as an egg-replacer; but substituting it for part of the flour in a recipe for baked-goods, too, lowers the carbs and increases the nutrition. To start: Preheat oven to 375°F. Grease a jumbo muffin tin for 6 muffins, or line it with cupcake papers. In a small bowl, cover the raisins with hot water and allow to soak while preparing remaining recipe. Prepare the batter: Whisk together flour, flax meal, sugar, baking soda, spices and salt. Add the nuts and fold into the flour mixture. In a separate bowl, mix together the egg replacer mixture, oil, baby food carrots, soy milk and vanilla. Add these wet ingredients, along with drained raisins to the flour mixture and stir with a wooden spoon until combined. 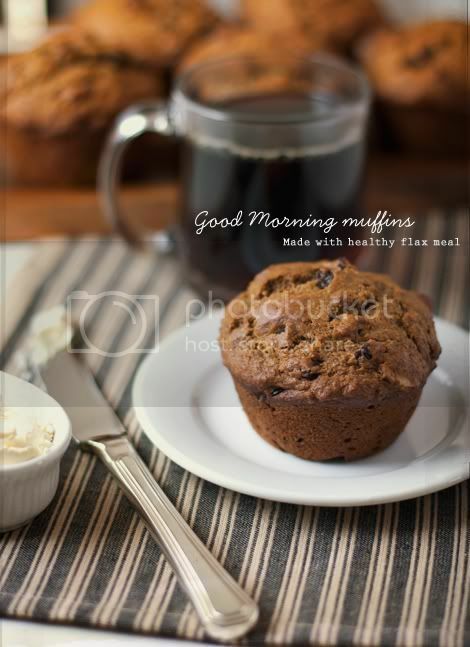 Bake the muffins: Fill muffin tin to the top of each cup. Bake for 22 to 25 minutes or until a toothpick inserted into the center of one of the muffins comes out clean. Cool in the pan for 5 minutes and then turn them out on a baking rack; allow muffins to cool completely, or enjoy them with some Earth Balance Natural Buttery Spread while they’re still a little bit warm.